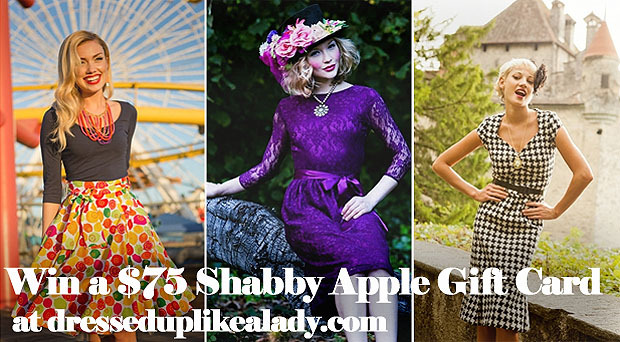 My friends at Shabby Apple are offering a free $75 gift card to one lucky Dressed Up Like a Lady reader! As you can see, I am in love with the Calliope skirt. And also, the Tea Time purple lace dress. And um, also, the Estate houndstooth pencil dress. And those are just my top three! 2.) Comment here with one of your favorite pieces from Shabby Apple! That's it! I'll select a winner via random number this Friday, April 26th! Remember that if you comment anonymously, you will need to include an email so I can identify you as the winner! I'm a Locksmith, so I kind of fell in love with the "Unlock the Queen's Castle" Necklace. I like SA on FB and I love the Arripidae dress! Thanks for the giveaway. i've narrowed it down to a 3-way tie for favorite: the "elizabeth islands" dress, the "cider" dress, and the "salt water taffy" blouse. all of their pieces are so cute! TULLE TULLE TULLE! After carful consideration of all the tulle skirts they have available, The Blossom tulle skirt, the pale pink would go so nice with my spike hi tops and a cut up tee, hello punk rock ballerina! the Shabby apple looks very nice. Had not heard of them before. But now I happen to love two things there... Joyride (White and blue Polka Dot Dress) and Freedom ( A hand done artwork in the home section) and such gorgeous and positive names too. I totally want to buy the Bampton dress right now! It's beautiful and it's rhymes with my last name. Style gets personal. I like the Boogie Woogie dress. <3 Shabby Apple and already like on Facebook :). Ohh forgot to say what my favorite piece is. The white tulle skirt is something I have been eyeing from them for a while. I like Shabby Apple on Facebook and you know, I could certainly live with wearing that I'm Late I'm Late lace dress! I like them on Facebook and I love the Bernini and Santa Monica dresses! I love their blue racer skirt, it would be so pretty dressed up or down. One of my favorites is alice I love the color! I need the Hart Swim Bottoms in my life & my pool! I like them on Facebook and my fave item (its so hard to pick!) is the Knave of Hearts dress. (you can click through to my profile to e-mail me). I adore Shabby Apple. I am seriously crushing on the One For My Baby dress. I am in complete LOVE with The Mad Hatter collection. The March Hare dress and The Caterpillar skirt are exquisite. I also love the fact that The Shabby Apple offers Plus sizes for the ladies with even more lovely curves. Love the Sea Breeze dress! I would love to get the Sun & Sand blouse! I am loving the new Orchid dress from the Fete des Fleurs collection. I love the Orchid dress in the mint color! Thank you so much for introducing Shabby Apple to me! I will definitely be shopping here from now on. Awesome giveaway and blog. If I win I'd love to feature your blog and my prize on my blog. Thank you for the opportunity, Dressed Up Like a Lady! I liked 'Shabby Apple' on Facebook! Oh, I really like lace and nautical things, so I'd have to go with the I'm Late! I'm Late! dress and Riptide. I love the Bon Voyage dress -would work well in my office setting but is still feminine. I liked them on Facebook.